Is there a way to change Congressional apportionment in the House to make it “fair”? If yes, how? If no, why not? Article I section II of the Constitution sets up the House of Representative as being the house of congress with equal representation among all American citizens. For most of American history this has been accurate, each representative having almost an equal number of citizens within their districts. However, as the American population took off in the early to mid 20th century and more people moved from the country to the cities, the equal distribution of representation has decreased. Congress capping the number of House representatives at 435 seats in 1929 only made this problem worse. It has increased the number of citizens each seat represents and has widened the gap of how many people one representative represents such as the case of Wyoming and Montana. Wyoming’s house member represents 579,315 citizens while Montana’s represents over a million. This means that a citizen in Wyoming has more of a voice in Congress than a citizen in Montana. They will also have a better chance of contacting and voicing their opinions to their representative then Montanans. Another glaring problem with representation is the fact that there are American citizens who have absolutely no voice at all. People living in legal American citizens. With the Constitution stating that all citizens will have equal representation in the House, we are denying this given right to over 4 million American. The only way to fix this by removing the cap of 435 seats and redistributing seats to be more even. Many politicians will argue against this due to it possibly increasing the number of seats one party has over the other. However putting partisanship aside, all Americans should want everyone to have an equal voice in the House. Seats should be given to DC, Puerto Rico, and Guam based on their population sizes and congress should divide seats in a way that makes the margin of difference of how many citizens a representative represents as small as possible. Equal representation among citizens should be an important issue for any politician because if it’s not the case then the government is going directly against how it was intended to be. In the politics, society, and law scholars program all incoming freshmen get broken up into small groups and assigned to two second years, who are supposed to act as their mentor throughout their first year. For my interview I interviewed Emma King, one of my mentors. Emma is from Sylvania, Ohio, a city north of Toledo near the Ohio-Michigan boarder. She is a political science and psychology double major and after she graduates she wants to pursue a career as a criminal defense lawyer. Emma said that her favorite part about OSU is the fact that there is always something to do, whether its on campus or off. Outside of PSL, Emma is also apart of Ohio State’s very successful mock trial team and college dems. Emma said that the main reason why she decided to apply to become a PSL mentor was because her mentors last year were not really involved and she wanted to be someone that the freshmen could look to for help and ask for advice from. Emma also said that her favorite PSL event last year was the Halloween party because it is her favorite holiday and getting to dress up with everyone was a lot of fun. For the last part of my interview I decided to ask Emma about recommendations for the best spots to go to around campus. She recommended studying in the basement of the Union because there is almost never people down there or at Orton Library. She also said that her favorite places to eat on campus is at the Union market or Mirror Lake Eatery. 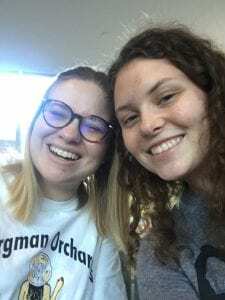 Overall, my interview with Emma was a lot of fun and it was great getting to know more about her and have an upperclassmen to talk to about campus and upcoming PSL events.